So You Need an App Launcher? I'm a long time LaunchBar user. It's great for launching apps and a whole lot of other things. But there are those occasions when I just can't remember the name of the app I want. Call it old age or call it exhaustion or call it beer. Whatever the case, it happens. But browsing my application directory is like trying to find the one copy of "The Wall" in a pile full of Meatloaf CDs at Walmart. It'll eventually happen, but not before I stop caring. Keyboard Maestro has me covered. I setup one application launcher group with several macros. Each macro is a launcher for a specific category of apps. There are some applications that are in multiple categories. Some categories have applications I almost never use but I'm glad when I do. 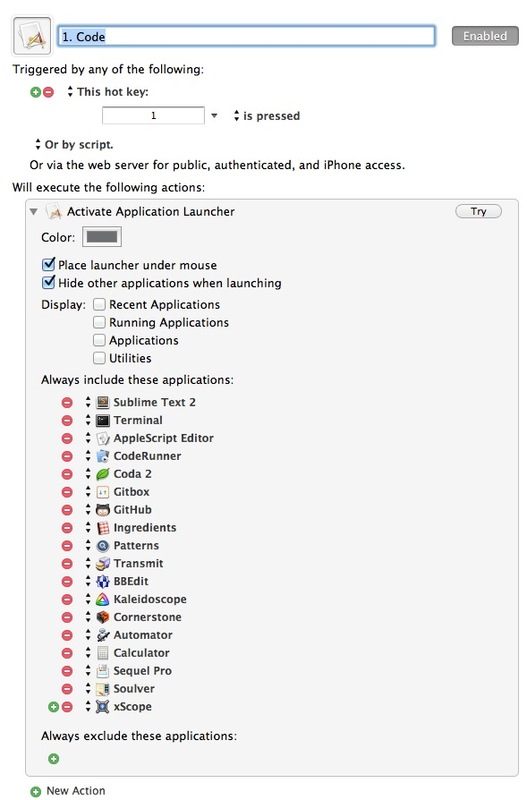 Each macro is a single "Activate Application Launcher" action configured to hide other applications. I then select a group with either the mouse or a number hot key. For example, "1" for my group of code related applications. Keyboard Maestro gives me a nice full screen selector to browse and launch from. Works with keyboard or mouse. The application launches and all others are hidden at the same time.